Police responded around 6 p.m. Wednesday to Mill Street boat ramp in Merrimack, New Hampshire for a reported shooting. 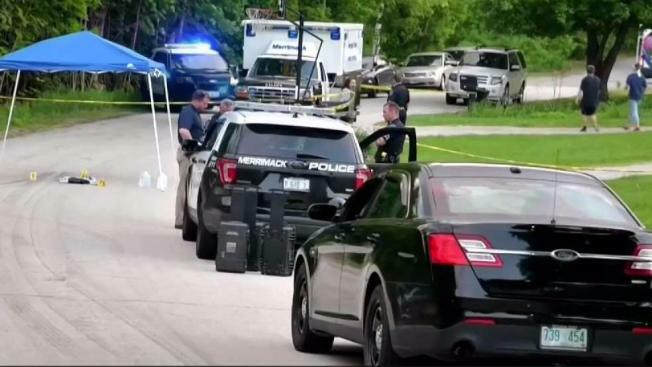 Three people have been arrested in connection with a New Hampshire shooting on Wednesday. Merrimack police say Jackson Crawford, 22, of Merrimack, shot another man near the Mill Street boat ramp around 6 p.m. Wednesday. Police were searching for Crawford, who was considered armed and dangerous. Crawford was located walking with two other people who are believed to have been in the car at the time of the shooting. Crawford, along with Robert Brown, 18, of Nashua, and a 17-year-old juvenile, were taken into custody on Daniel Webster Highway. Crawford was charged with attempted murder, robbery with a deadly weapon, and first-degree assault with a deadly weapon. It's unclear what charges the juvenile is facing. Brown was charged with robbery with a deadly weapon, falsifying physical evidence, and resisting arrest. The victim, who was shot in the stomach, was taken to a Nashua hospital before being transferred to a Burlington, Massachusetts, hospital to treat his injuries. There was no update on his condition. Police are trying to locate the vehicle that was involved in the shooting, described as an older model, possibly blue, Toyota Corolla. One window may be shattered, according to police. Crawford and Brown were scheduled to be arraigned Thursday at Hillsborough County Superior Court-South. The juvenile was scheudled to be arraigned in Juvenile Court. It's unclear if they have attorneys.